Often, I am asked, “What does homesteading mean?” To our ancestors this was just the way of life, a homesteader was equivalent to a farmer pretty much. You farmed your land producing most, if not all, your family’s food. In our modern day, the question “what does homesteading mean?” elicits varied responses depending on whom you ask. The sum of them all is this, “Providing as much for your family as you can on the land you have.” There is some disagreement about how much land you must have to be a “homesteader”, but for me, it’s an issue relative to the individual situation. Homesteading today is more about the degree of self-sufficiency you desire. Some people have huge tracts of land and farm absolutely nothing. What a waste. While others have gardens, goats, and chickens on their city lot. Does it really matter what we call ourselves? Let’s face it, there are obstacles in any lifestyle. The obstacles we face in homesteading largely depend on the choices you make. To what degree do you homestead and to what degree of self-sufficiency you aspire to? Your answer to these two questions will set basic challenges before you. While you ponder those two questions, let’s take an open look at some of the challenges. Maybe by doing this, you’ll be able to make wise, conscious decisions to help your family overcome the obstacles to homesteading you face. Most of us who homestead have more homestead than money. There simply seems to never be enough. In the current condition of our country, this can be said of anyone really. However, since we’re talking about obstacles to homesteading, we’ll say this is often the largest challenge for many. In our economy, most people exchange their time and freedom for money with a traditional job. On a homestead, time and freedom are required to accomplish the chores and daily tasks which provide the self-sustaining lifestyle we hold dear. Needless to say, a homesteader may have to be creative in overcoming financial obstacles. Homesteading families often have one member who takes an outside job exchanging some time for money. This allows them to live some of the life they desire. Others look for ways to make money online. Many sell products made from their homestead. Still, others do a combination of these or are even more creative than this and make their own way. No matter how much of a self-sustaining lifestyle you live, there always seems to be a need requiring money. If you’re lucky enough to live in a community of homesteaders, you may be able to barter for most of your pressing needs. You may have a valuable skill or resource which can be the key to keeping your need for cash flow low. The weather is all important to the homesteader. It is a major reason we have to be flexible. I remember 2016 as it brought flooding to many in the deep south. After years of drought, we planted as usual only to lose it all to a flood in areas which had never flooded before. The old saying, “The best-laid plans of mice and men,” is never truer than when it comes to weather. When you face this obstacle, you must be flexible. Reprioritizing your plans and moving on to the next chore is all you can do. Weather isn’t the only obstacle which will keep you flexible or frustrated. There are the million and one ways something can come up on a homestead in the blink of an eye. It’s not a question of if, but when you’ll have to change your plans and turn 180 degrees on a dime! Ready to harvest your garden? That may be the exact time a colt gets colic. Then you’ll spend hours leading a horse around in circles hoping for poop. Just ask me how I know! Bullet, our horse, became a top priority in a matter of seconds a few years ago. You must be flexible. If not, you’ll be frustrated. If you’re like me, you like checking off the boxes on the “To Do List.” There’s never a day when all the boxes are checked. There’s always a chore needing attention. It’s part of the homesteading life. Take everything with a grain of salt and pinch of sugar. Frustration and anger will not help you accomplish anything. Don’t be unreasonable in your expectations of yourself or others. To be an overcomer, you’ll need to see the sunny side and have faith, knowing there is a time and season for every good work on the homestead. On a homestead, a skill is as good as money in the bank. You can barter skills, trade items you make, and some skills become relaxing and even hobbies. You never get too old to improve a skill or learn one. Developing a skill which allows you to make a little money, is a blessing indeed! Homesteading skills may include knitting, woodworking, metalworking (forging), leatherwork, mechanical repair work, horticulture, food preservation, writing books or a blog to help others, animal husbandry, on and on the list could go. There are some skills and abilities which aren’t as tangible. When your cow is in trouble do you have a level enough head to think clearly, finding a solution before it’s too late? If you have to say, “No,” there are options. Do you know someone who keeps a cool, level head in the face of adversity? If you do, they’re the ones to call in this situation. Each of us has strong points which come in handy at just the right time. Reach out to people whom you trust and build real, solid relationships. 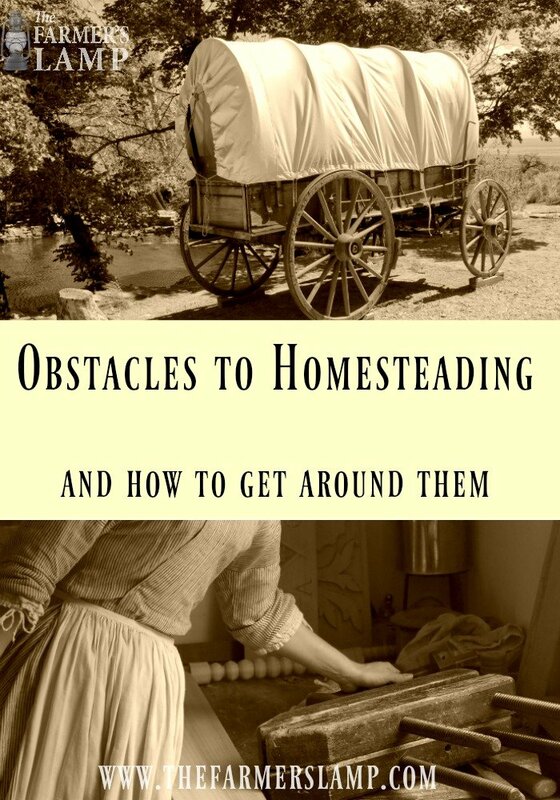 These relationships can help us survive obstacles to homesteading. If we put our heads together and pool our skills and resources, nothing will be impossible for us. There’s never enough time to do everything. There haven’t been many nights when we lay down and don’t think of something we wish we’d gotten to that day. Prioritizing is a skill someone on your homestead must have. Time can be an obstacle to homesteading, but it’s manageable and can be used wisely. Time management for work is important, but taking time to enjoy the fruits of our labor and the blessings of our homestead are just as important. Your homestead is where you hang your heart, wipe the sweat from your brow, bind the bleeding cuts, and find the balance of your spirit in its breeze. It’s the place you find solutions to the issues you face. The freedom you feel on a homestead is almost tangible and visibly changes the people and things around us. 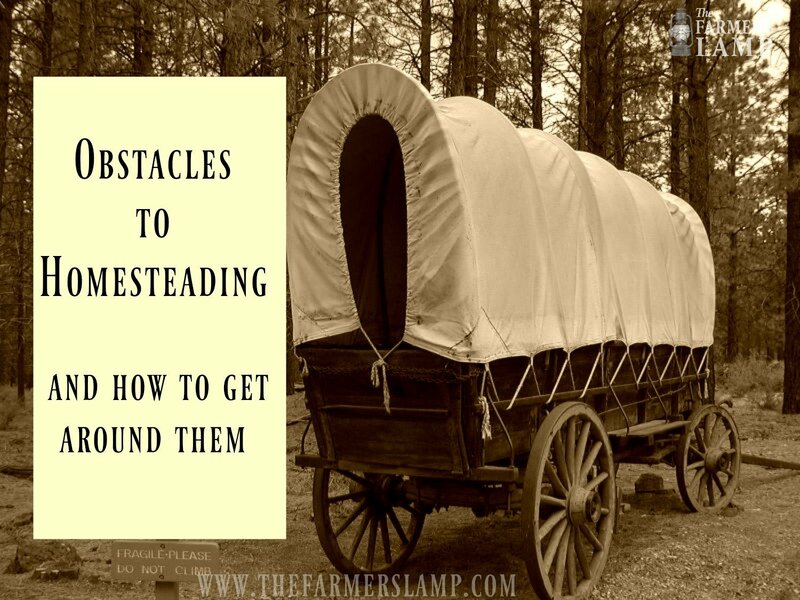 There are obstacles to homesteading but they’re not insurmountable. Which of these do you face? Do you face obstacles we haven’t mentioned? Share your experience with us in the comments below.